The animal it comes from is quite distinctive, with loads of character, so it’s no big surprise that so many of you managed to identify it. 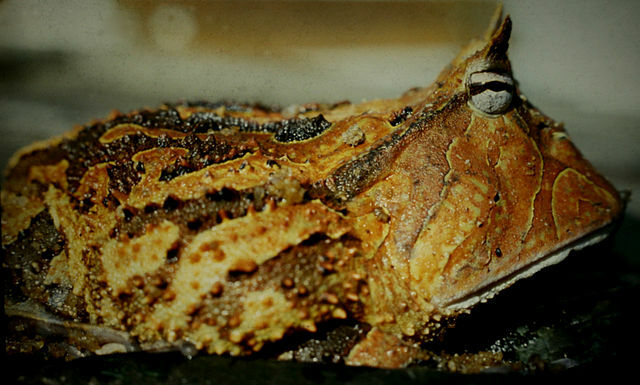 So well done to Jake, Dave Godfrey, henstridgesj, Mieke Roth, Wouter van Gestel, Steven D. Garber and Crispin – this is indeed a Pacman Frog in the genus Ceratophrys and more specifically the Surinam Horned Frog Ceratophrys cornuta (Linneaus, 1758). These bizarre South American amphibians have huge mouths and will eat anything that moves and will fit into their gaping maw, from mice to snakes and other frogs. They are sit-and-wait predators that bury themselves in leaf-litter and soil, waiting for an unsuspecting meal to wander past, which they then leap on with an open mouth. Their colour keeps them well camouflaged and I expect that their ‘horns’ help break up their outline and keep debris away from their eyes. Who knows, perhaps the ‘horns’ also help to make their heads too big to fit into the mouth of their conspecifics – after all, cannibalism is rife among these beasties! Beasty is right – a gaping maw, eats snakes and its own kind! Wow! I wouldn’t recognize the dog’s bone if he brought it over to me – so I am impressed that people can identify these bones – I don’t know how I thought they stayed together, but I didn’t even know frogs had bones (sounds really silly now that I think of it). I will never know what something is on Friday, but I do enjoy you explaining things on Monday! Thank you! Is Jake really eleven years old? Oh my, what an incredible boy! I thought the exact same thing – it must be the mouth position, slope of the face and the horizontal bar in the eye, since Hypnotoad doesn’t have horns.